What is Man-made Fiber in Textile? Man-made or chemical fibers are those fibers whose chemical composition, properties and structures are significantly modified during the manufacturing process. This type of fiber consists of regenerated fibers and synthetic fibers. In case of regenerated fiber, the molecules in thread-state are separated from organic natural objects and collected. These are separated from each other completely and arranged in order once again. Thus the fiber is formed. In case of synthetic fiber, the molecules in thread state are synthesized and chemically. The thread state fibers are arranged to form these fibers. In case of inorganic fiber, it is formed by turning inorganic object to fine fiber state. 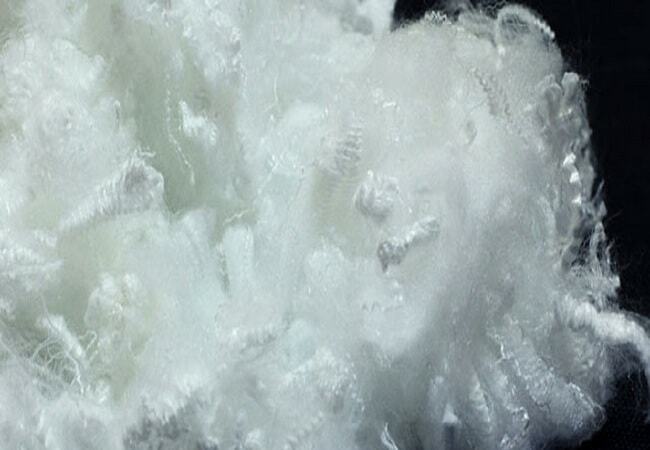 -The fibers manufactured from cellulose (Viscose rayon, viscose staple fiber, Bemberg etc.). -The fibers prepared from vegetable allbuminous substance (Soyabean casein fiber, peanut albumin fiber, maize protein fiber etc.). -The fibers prepared from animal albuminous substance (Cow’s milk casein fiber). However, out of these too, the most important ones are the fibers from cellulose, especially, the rayon and staple fiber produced by viscose method. There are different types of synthetic fibers, but among those, polyamide series was prepared at the beginning and it is widely used in the world even today. Nylon is one of its representatives. The next ones, close on its heels are fibers of polyester series (Tetron, Terylene, Dekron etc.) and fibers of Polyacryl series (Oron, Exlan, Bonnel, cashmilon etc.). Apart from these, the fibers of polyvinyl alcohol series (Vinylon) and fibers of polypropylene series (Pylene) are also growing relatively. However, these have not developed as much as expected at the beginning. In accordance, the production volume of polyester is at the forefront in our country. Polyester, Nylon and Acryl are the three main synthetic fibers. Acetate rayon is another man-made fiber but unlike viscose rayon etc, the cellulose is made to undergo acetic oxidation and it is turned to acetic acid cellulose. This is dissolved in a solvent and spun into man-made fiber. Therefore, chemically, it can also be called as semi-synthetic fiber. In addition, the fiber called chinon which is a fiber made after co-polymerization of natural properties and synthetic properties. It also belongs to this group. However, this name s only a logical term and it is not used much in the general market. Among the man-made inorganic fibers, glass fiber and rock wool are the two substances which came into use comparatively early and which still have a good demand and production. Apart from these, there are carbon fibers, Silicon carbonization fiber and Stainless steel fiber. However, their production volume is very low. Their cost is high and the usage is also limited to some specific objects.